If you ask a group of price action traders about their favourite tool, one of the top answers will be trend lines. Trend lines and price channels are the best tools for amplifying the power of price action. In this article, you will learn a powerful pullback trading strategy. It is a simple approach using nothing but trend lines and channels. But before that, let us recap on the trading tools: trend lines and price channels. IMPORTANT: The explanations below are for bullish price action. Invert the rules for their bearish equivalents. Connect the two points with a straight line. Project the line to the right. When unbroken, it acts as a price support. When broken decisively, it flips and serves as a price resistance. Remember, these rules apply to a bullish trend line that is sloping upwards. A channel is a natural extension of a trend line. 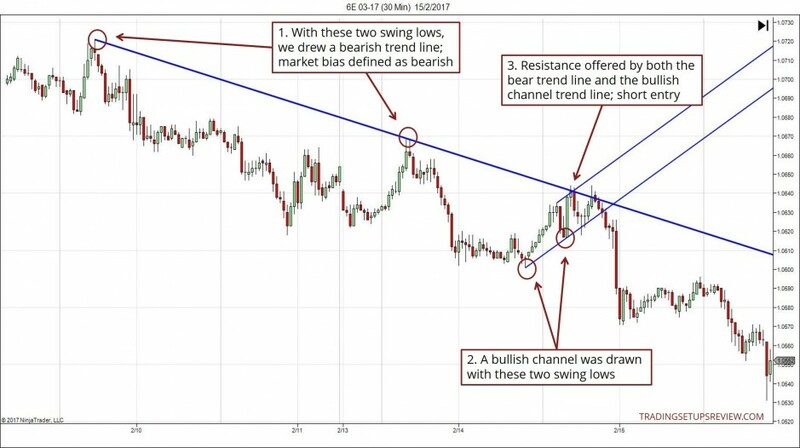 You must know how to draw a trend line well before you can master the channel. Draw a line that is parallel to the trend line. This line is the channel trend line. Recall that a trend line is drawn with two swing lows. Find the highest swing high between the two swing lows. This swing high is the anchor point. Now, affix the start of the channel trend line to the anchor point. Together with the trend line, you’ve got yourself a price channel. In theory, the channel is supposed to contain price action. When the market exceeds the channel, it is likely to be repelled back into the channel. Now, let’s apply these tools using a standard pullback strategy template. Define the market bias with a trend line. Identify an overextended pullback with an opposing price channel. Time the trade entry with the confluence of the trend line and the opposing channel trend line. Refer to the chart examples below to see this strategy in action. 1. These are the two pivot lows used to draw the bullish trend line. This trend line tracked the bullish market bias. 2. These two pivot highs formed the basis of the orange bear channel. 3. When price hit the bear channel trend line, it was a signal that the pullback was about to end. 4. 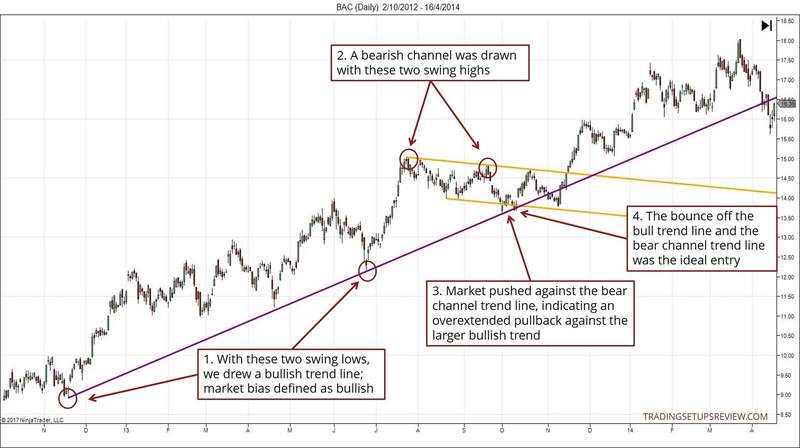 The bounce off both the bull trend line and the bear price channel was a result of solid market support. It was the ideal long entry. You might find it hard to see the price action details in this example. But the scale of this chart is needed to show the market context. It’s important to know that the pullback took place in the setting of a steady bull trend. Let’s take a look at how this simple strategy works for intraday time frames too. 1. With these two pivot highs, we drew a bear trend line. 2. An opposing bull channel was drawn with these two pivot lows. 3. Both the bear trend line and the bullish channel trend line resisted the pullback. It was an excellent short trading setup. Look closely at both examples. You will notice that both charts showed double bounces off the channel trend line. Such mini double top/bottom formations are common in setups featuring complex pullbacks. This pullback strategy is a minimalist trading method with great potential. First, the trend line forces you to pay attention to the trend and price action. Then, the price channel helps you to find steep pullbacks against the trend. These high angle pullbacks tend to fail spectacularly and lead us into the best trades. But there is a common pitfall. Traders often get confused because they are not sure how to select the swing pivots. They also lack a clear set of rules for drawing the trend lines and channels. So you must figure that out first. 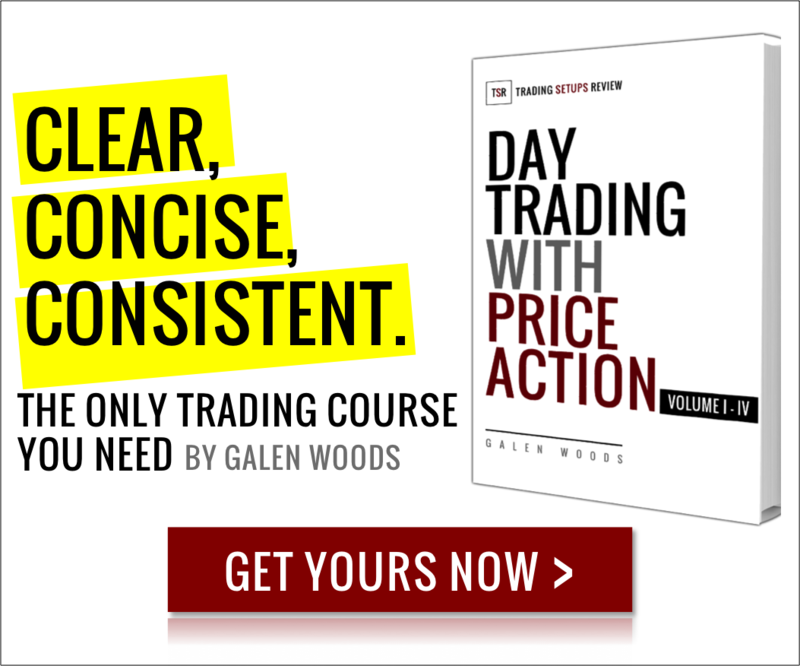 Learn a fixed method to identify pivots, trend line, and channels. Then, make an effort to stay consistent. Don’t look back in time and try to adjust your trend lines after the trade. Take care of this aspect, and you can safely make the most out of this trading strategy. 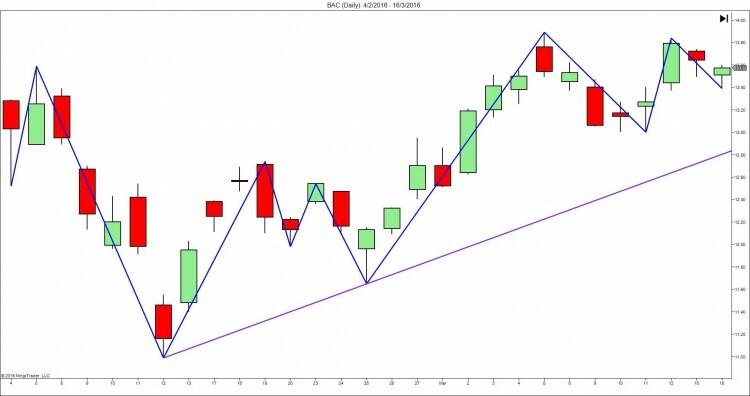 In the examples here, I’m using the trend line and channel techniques taught in the Day Trading With Price Action Course. You need not use the same methods. Instead of chasing after the best trend line drawing method, remember that consistency is more important. In these examples, we drew the trend lines using valid pivots as taught in the course. For consistency, it’s a rule you should stick to. After all, we are fading the opposing channels. So, it makes sense to use the less significant basic pivots to draw them. Yet your posted screenshot depicts the opposite. Thanks for the question. It gives me a chance to clarify. Point 3 on both charts show how the market is repelled back into the channel. This general rule is not infallible. The repelling is more likely when the market is moving against the larger trend as shown by the trend lines in both charts. When the market exceeded the channel in the other direction, which went along with the more significant trend, the channel failed to contain the price action. Yesterday i read this information and today same scenario observed in real time ( Bullish channel with Bearish Trend Line). That’s great! The best way to internalize this method is to spot it in real time.